The third stage is the pupa. This time adult forms appear. 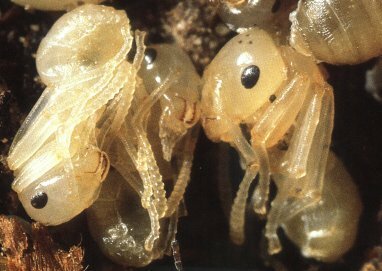 Unlike larvae, pupae do not feed because their digestive system is completely changed. It is a long sleeping period lasting several weeks or even months. During this time, while the pupa is motionless, are formed the various parts of the adult body. By the way, notice the 3 points at the top of the head of right pupa. These are the ocelli, small eyes that are found only in queens and males which allow infrared vision.